What Kind of Flooring Goes With Paneling? When updating a kitchen or bathroom, the use of both granite and tile together can make a striking combination. Tile can be used as a back splash and they both can complement each other in color and texture. Granite and tile combinations can work for a variety of home decors. Granite counter tops are popular for kitchens. The use of tiles as a back splash gives the homeowner a chance to complement the granite or introduce a new theme to the room palette. Place a few sample tiles against the granite and look at the combination in different lights before purchasing. Large areas of granite can sometimes overwhelm a room. Choose colors for tiles in a complementing shade or choose those colors that are flecked or swirled throughout the granite. Appliances and kitchen accessories can be used to unify the granite and tile colors as well. 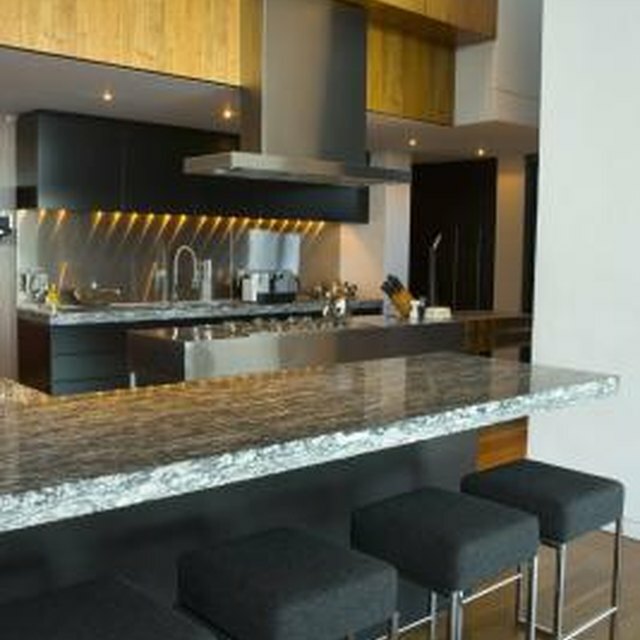 Counter tops and walls with different textures can complement each other. Tiles with a tumbled appearance or those with rounded edges can break up harsh granite edging. Conversely, small square tiles go well with solid granite counter tops that have rounded and smooth edging. When Laying Marble Tiles Do You Go With the Veining?